Two forktail species, the Rambur’s (Ischnura ramburii) and the Desert (I. barberi) Forktails are commonly found in the southern half of Arizona (Paulson 2009). The two species use various habitats including ponds, lakes, marshes, etc, and they are often encountered at a same site. Despite this similarity in habitat choice, the Rambur’s and Desert Forktails have different phenologies: the Rambur’s Forktail in Arizona flies year-round whereas the Desert Forktail is normally not seen flying between November and early February. 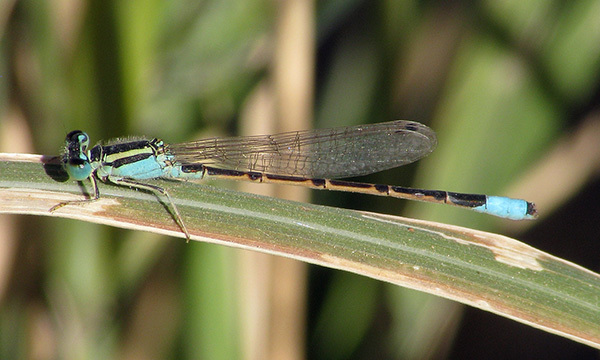 On 17 November 2010 one male was observed at the Painted Rock Dam pond along with several Rambur’s Forktails. This record sets a new late flying date for the Desert Forktail for Arizona.